Using data from experiments performed in 2010 at the Large Hadron Collider (LHC), the world's largest particle accelerator near Geneva, Switzerland, scientists are studying rare particle decays that could explain why the universe has more matter than antimatter. Thousands of computers filter those remaining images, looking for traces of the Higgs boson, which decays quickly. "It only lasts for less than a billionth of a billionth of a second, so we never see the Higgs itself. We only see the things it decays into, and we only have this sort of indirect evidence at first. We have to go through and try to work out what happened," explains physicists Michael Tuts at Columbia University and Kyle Cranmer at New York University. "People have likened it to taking two Swiss clocks and smashing them together, and looking at the gears flying out, trying to figure out what was going on inside!" The particle detectors used to identify the Higgs boson are the size of a six-story building, full of hundreds of millions of electronic instruments. 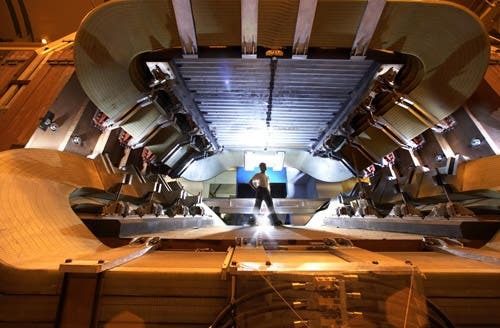 The ATLAS detector works like a huge digital camera. It records hundreds of billions of protons colliding at nearly the speed of light. This "camera" takes 40 million pictures per second. The search for a mysterious subatomic particle can certainly involve some enormous tools, not to mention a multitude of scientists. The effort to find the elusive "Higgs boson" includes over 5,800 scientists from 56 countries! It's a subatomic particle that gives other particles, such as quarks and electrons, their mass. Why the intense search for the Higgs? Over the past few decades, scientists have been trying to understand all the different building blocks of nature. They came up with a theory called "the Standard Model." "We've been checking it in all sorts of experiments all across the world for decades, and it's just the theory that refuses to fail. It has passed every test that we've thrown at it," says Cranmer. "But one of the real mysteries was that there was one more particle in this theory that we hadn't seen, which is the Higgs boson. So, somehow, in some sense, we knew the theory was right because it had worked so well but, in other ways, it was this mystery, because there was a missing piece." On July 4, 2012, CERN's Director General Rolf Dieter-Heuer cautiously announced the discovery of a new particle, with all the proper characteristics of a Higgs boson. "They had finally collected enough data that they could actually, definitively say, "We've seen something, and that something looks like a Higgs boson," says Tuts. For these two physicists, and thousands of others around the world, the adventure is just beginning. Still ahead at CERN is an effort to unravel more exotic mysteries, from figuring out what happened immediately after the Big Bang to discovering extra dimensions of time and space! "It's like Columbus heading off into the ocean. We don't know what's going to be there. Maybe we'll discover America. Maybe we'll discover India. Who knows? This is a triumph of human curiosity. It's really key to our understanding of the universe," says Tuts. Antarctica's 'South Pole Telescope' –"Seeking Clues to a New Physics of the Universe"
The Mystery of Red Giants in the Universe –Solved!